After Prussia was defeated by Napoleon in 1806, King Frederick William III (1797-1840) and his advisors instituted fundamental reforms. These reforms were implemented under the decisive ministerial leadership of Karl Baron vom und zum Stein (1757-1831) and, subsequently, by State Chancellor Karl August von Hardenberg (1750-1822). One central goal was to achieve the legal emancipation of hitherto landholding but legally subject peasants and to endow them with freeholds. The reforms also aimed to introduce a more productive system of free-market agriculture in the Kingdom of Prussia. 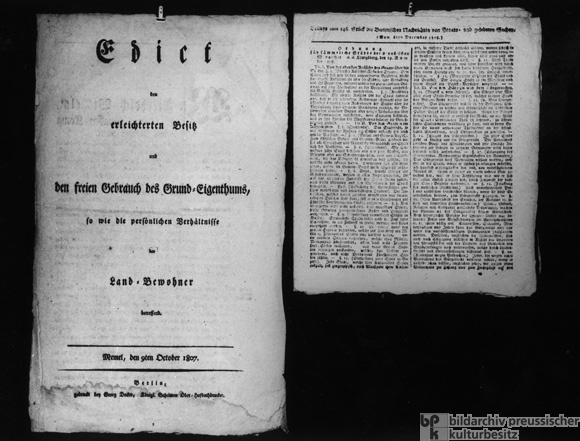 The reforms were laid out in the “Edict Concerning the Facilitated Possession and Free Use of Real Estate as well as the Personal Circumstances of the Rural Population” [Edikt den erleichterten Besitz und den freien Gebrauch des Grund-Eigenthums, sowie die persönlichen Verhältnisse der Landbewohner betreffend], more commonly known as the “October Edict” or the “Prussian Reform Edict.” The edict was signed in Memel on October 9, 1807. The title page and the text appear below. The edict ended any and all forms of hereditary or otherwise involuntarily subjection to seigneurial will and jurisdiction. The process of converting the landed villagers’ prior landholdings into modern freeholds was regulated by later edicts issued between 1811 and 1816. The process lasted up until and beyond the Revolution of 1848.